Incorporating Middlesbrough's industrial heritage and the unique history of the bridge itself. Using interactive displays, there is a viewing room and an outside viewing platform offering a superb setting to view this unique bridge and is ideal for art and photographic projects. The only working bridge of its kind in England. This unique structure dominates the Middlesbrough skyline was originally designed to allow tall ships to pass underneath. It opened in 1911 and can still carry 9 cars or 200 people on each crossing. Gantry system. The Visitor Information Centre promotes the history of the bridge and surrounding area through the use of graphic panels, video, computers, objects and models. (Contact for opening times of Centre.) Shop on site. Bungee Jump from the transporter bridge! 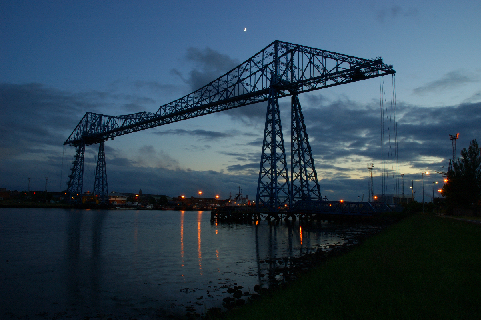 Bungee jumping at the Transporter Bridge takes place every Sunday morning between 9am and 1.30pm. The 'jumpers ' need to book the jump and report to the Visitor Centre on the Sunday morning. They are then registered, weighed and have to sign an indemnity form, then they are fitted with a harness before being taken up to the top walkway of the bridge. Once they are on the top walkway they are weighed again and fitted with the required bungee rope for their weight. They bungee off the centre of the bridge 160 feet above the river. They are then lowered into a boat on the river and transferred back to the shore.